The Code CR5000 is a hands-free presentation scanner, and scans 1D barcodes, 2D barcodes (including QR codes), and off of mobile phones. With an optional age verification mode*, the CR500 is excellent for saving time while checking IDs, increasing efficiency. The CR5000 can switch out of hands-free mode into trigger mode for individual barcode reading. An optional Bluetooth cable is available to convert the scanner to Bluetooth mode for use with tablets. 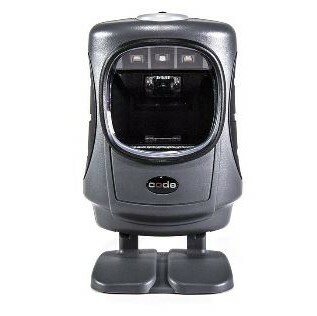 The Code CR5000 hands free barcode scanner is a versatile barcode scanner that scans 1D and 2D barcodes, stacked barcodes, and postal codes. It reads barcodes on ID cards and gives good read/bad read verification via audible tone.